Alzheimer's disease (AD) is a progressive neurodegenerative disorder manifested by cognitive deficits and impairment of activities of daily living. Abnormal amyloid accumulation as a result of changes in production, processing, and/or clearance of brain Aβ appear to be a critical event in the development of neuronal dysfunction, degeneration, and amyloid pathology in AD. Although our understanding of the molecular basis of the disease is increasing, there are no disease-modifying treatments (Ballard et al., 2011). β-Site amyloid precursor protein (APP) cleaving enzyme1 (BACE1) and γ-secretase are involved in processing of the APP to Aβ peptides and have thus emerged as key targets for the treatment of AD (Vassar et al., 2009). Increased accumulation of Aβ results in the formation of Aβ oligomers, cerebral amyloid plaques, neurodegeneration, and brain atrophy (Hardy and Selkoe, 2002). Genetic mutations in APP have been associated with altered BACE1 activity with negative and positive implications for AD. APP with the Swedish mutation (K670N/M671L, APPSWE) has a higher affinity for BACE1, increasing Aβ production and AD onset (Citron et al. ; 1992). Recently, another variant of the APP gene (A673T) was reported. This substitution is located proximal to the BACE1 cleavage site and reduces BACE1 cleavage relative to wild-type APP (Jonsson et al., 2012). BACE1 knock-out mice confirmed the pivotal role of BACE1 in Aβ production by showing that production of Aβ in brain was reduced (Roberds et al., 2001). The role of BACE1 in Aβ plaque deposition is further supported by a study in which transgenic mice overexpressing human mutated APP crossed onto homozygous or heterozygous BACE1 knock-out mice display reduced Aβ generation and plaque pathology (McConlogue et al., 2007). BACE1 inhibitors are expected to reduce generation of Aβ and consequently decrease Aβ toxicity and the formation of amyloid plaques. Reduction of brain Aβ levels after administration of BACE1 inhibitors have been demonstrated in several animal models including primates (Stachel et al., 2006; Sankaranarayanan et al., 2009; May et al., 2011; Huang et al., 2012; Jeppsson et al., 2012). Reports on BACE1 knock-out mice suggest that BACE1 is important during development and complete inhibition of BACE1 may result in side effects (Willem et al., 2006; Cai et al., 2012). These observations raise concerns whether complete inhibition of BACE1 in a chronic setting is safe and may have implications for the development of BACE1 inhibitors for therapeutic use. Several BACE1 inhibitors are currently in clinical development and have reported CSF Aβ lowering in Phase I clinical studies (May et al., 2011; Forman et al., 2012; Lai et al., 2012). This is a promising first step to testing the potential of BACE1 inhibition as modifying the course of AD. We report the discovery and pharmacological profile of a potent and selective, orally active, brain-permeable BACE1 inhibitor AZ-4217 with excellent in vivo efficacy. Central efficacy was observed after a single dose in three different animal models: mice, guinea pigs, and Tg2576 mice. Furthermore, we demonstrate that chronic treatment with AZ-4217 lowers amyloid deposition in 12-month-old Tg2576 mice. 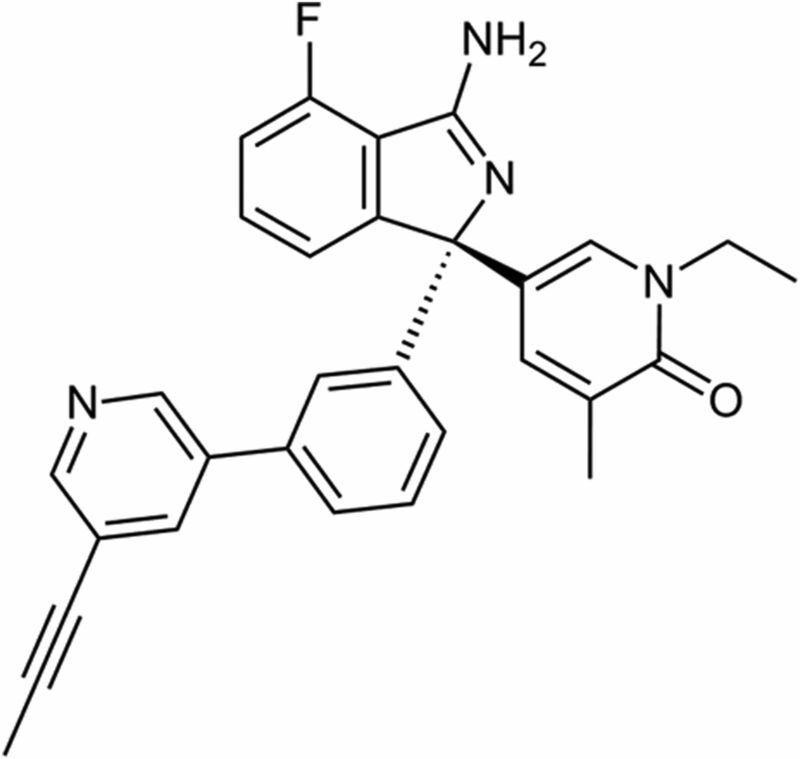 The AZ-4217 was designed and synthesized at AstraZeneca R&D and the chemical structure is shown in Figure 1 (Swahn el al., 2012). hBACE1 and hBACE2 TR-FRET assay. The procedure used has been described previously (Swahn et al., 2012). In short, the soluble part of the human β-secretase (recombinant hBACE1 enzyme, amino acids 1–460, or hBACE2 enzyme, amino acids 1–473) was mixed with compound in reaction buffer (Na-acetate, CHAPS, Triton X-100, EDTA, pH 4.5) and pre-incubated for 10 min. Substrate (Europium)CEVNLDAEFK(Qsy7) (PerkinElmer) was added and the reaction was allowed to proceed for 6.5 h in darkness under lid at 22°C until stopped with the addition of Na-acetate, pH 9. The fluorescence of the product was measured on a Wallac Victor II 1420 Multilabel Counter plate reader (PerkinElmer) with an excitation wavelength of 340 nm and an emission wavelength of 615 nm. Cathepsin D enzyme (Calbiochem) and substrate (Ac-Glu-Asp(EDANS)-Lys-Pro-Ile-Leu-Phe-Phe-Arg-Leu-Gly-Lys(DABCYL)-Glu-NH2) (Bachem) were separately diluted in glycine-HCl buffer. Cathepsin D was mixed with compound dissolved in dimethylsulfoxide (DMSO) and pre-incubated for 10 min. Substrate was added and the reaction mixture was incubated for 15 min in darkness at 22°C. The fluorescent signal was measured on a Wallac Victor II 1420 Multilabel Counter plate reader (PerkinElmer) with an excitation wavelength of 355 nm and an emission wavelength of 460 nm. SH-SY5Y cells were cultured in DMEM/F-12 with Glutamax, 10% fetal calf serum (FCS), and 1% nonessential amino acids (Invitrogen). Compound was incubated with cells for 16 h at 37°C, 5% CO2. MSD plates (Meso Scale Discovery) were used for the detection of sAPPβ release according to the manufacturer's instructions, and the plates were read in a SECTOR Imager. In addition, the cell plates were used to analyze cytotoxicity using the ViaLight Plus cell proliferation/cytotoxicity kit (Cambrex BioScience) according to the manufacturer's instructions. SH-SY5Y cells overexpressing APP695wt were cultured in DMEM/F-12 with Glutamax, 10% FCS, and 1% nonessential amino acids (Invitrogen). The cells were incubated with cell culture media containing AZ-4217 for 16 h at 37°C, 5% CO2. Invitrogen ELISA strips KHB3482 were used for the detection of human Aβ40 secreted into medium according to the manufacturer's instructions. The strips were read using a SpektraMax microplate reader (Molecular Devices). Mouse primary neuron Aβ40 release assay. Primary cortical cells were isolated from fetal C57BL/6 or Tg2576 mice (E16). The cortices were kept in calcium- and magnesium-free Earle's Balanced Salt Solution (EBSS; Invitrogen) containing 0.25% trypsin and 2 U/ml DNase for 1 h at 37°C and 5% CO2. The cortices were washed in warm CMF-EBSS and gently triturated with flame-polished pipettes to separate the cells. The cell solution was transferred to a 50 ml Falcon tube containing medium (10% HamsF12; 10% fetal bovine serum; 1% 10 mm HEPES; 1% 2 mm l-glutamine; 0.5% 50 U/0.5 mg penicillin-streptomycin, and 77.5% DMEM w/4.5 g/l-glucose), and filtered through a 100 μm Cell Strainer (BD Falcon). The cells were plated onto 96-well poly-d-lysine-coated plates at a density of 200,000 cells/200 μl/well. After 5 d at 37°C and 5% CO2, the medium was changed to medium containing AZ-4217 and a final concentration of 1% DMSO. After incubation overnight, the amount of released Aβ40 in the extracellular medium was measured using Invitrogen ELISA strips (KMB3481) according to the manufacturer's instructions. The strips were read using a SpektraMax microplate reader (Molecular Devices). The cytotoxic effect of compounds was directly evaluated on the cell plates using the ViaLight Plus cell proliferation/cytotoxicity kit (Cambrex BioScience) according to the manufacturer's instructions. Guinea pig primary neuron Aβ40 release assay. Primary cortical cells from fetal Dunkin–Hartley guinea pigs (E25–E27) were prepared as described above. The amount of released Aβ40 in the extracellular medium was measured using Invitrogen ELISA strips (KHB3482) according to the manufacturer's instructions. Rodent experimentations were performed in accordance with relevant guidelines and regulations provided by the Swedish Board of Agriculture. The ethical permissions were provided by an ethical board specialized in animal experimentations (Stockholm North Animal Research Ethical Board). Female 10- to 18-week-old C57BL/6 mice (Harlan Laboratories) were used. The mice (n = 6) received vehicle or AZ-4217 at 25, 50, 100, or 200 μmol/kg (12 mg/kg, 24 mg/kg, 48 mg/kg, or 95 mg/kg) as a single dose via oral gavage. As vehicle, 5% dimethylacetamide and 20% hydroxypropyl-β-cyclodextrin (HPβCD) in 0.3 m gluconic acid, pH 3, alone was used. Male 5-week-old Dunkin–Hartley guinea pigs were purchased from HB Lidköping Kaninfarm (Sweden). The guinea pigs (n = 6) received vehicle or AZ-4217 at 25 μmol/kg, 50 μmol/kg, or 100 μmol/kg (12, 24, and 48 mg/kg) as a single dose via oral gavage. As vehicle, 0.3 m gluconic acid, pH 3, was used. Tg2576 mice were purchased from Taconics, strain #1349 B6; SJL Mixed Background, randomized upon arrival into different cages, and aged in the animal facility at AstraZeneca R&D, Södertälje Sweden. The Tg2676 mice (n = 10–46), 12-month-old at termination, received 200 μmol/kg (95 mg/kg) AZ-4217 or vehicle (0.3 m gluconic acid) as a single dose, or as repeated doses once daily during 7 d or 28 d. Animals were anesthetized 0.5 h, 1.5 h, 3 h, 4.5 h, 8 h, 16 h, or 24 h after first or final administration of vehicle or drug, and were then kept under isoflurane anesthesia. CSF was aspirated from the cisterna magna (guinea pigs) and plasma was isolated from blood collected by cardiac puncture into EDTA tubes. Animals were then killed by decapitation and brains were dissected into hemispheres. Moreover, female Tg2576 mice were also terminated at different ages between 3 and 24 months to be able to study the variation of sAPPα and sAPPβSWE with age. Extraction and analysis of Aβ and sAPP in animal samples. The left brain hemispheres were sequentially extracted by diethylamine (DEA) followed by formic acid (FA), to obtain soluble and insoluble fractions of Aβ and sAPP species. C57BL/6 mouse and guinea pig brains were only extracted with DEA. In short brain tissue was homogenized/sonicated in 1:18 or 1:20 (w/v) 0.2% DEA with 50 mm NaCl, followed by ultracentrifugation. Recovered supernatants (soluble Aβ) were neutralized to pH 8.0 with 2 m Tris-HCl. The remaining pellet was sonicated in 1:18 (w/v) 70% FA, ultracentrifuged, and the recovered supernatants (insoluble Aβ) were neutralized to pH 7.5 with 1 m Tris at 1:20 (w/v) dilution. For C57BL/6 samples, Aβ40 and Aβ42 levels in DEA brain extracts and Aβ40 levels in plasma were analyzed using commercial Aβ1–40 and Aβ1–42 ELISA kits (KMB3481 and KMB3441; Invitrogen). sAPPβ in the DEA brain extracts were analyzed using MSD sAPPβ kit (K110BTE-2; Meso Scale Discovery). For guinea pig samples, Aβ40 and Aβ42 levels in DEA brain extracts, CSF, and plasma were analyzed using commercial Aβ1–40 (KHB3482; Invitrogen) and Aβ1–42 (80177 RUO; Innogenetics) ELISA kits. In the Tg2576 material transgenic human or mouse endogenous Aβ40 and Aβ42 concentrations in plasma, soluble (DEA) and insoluble (FA) fractions were measured by commercial sandwich ELISA kits, according to manufacturer's protocols (KHB3482, KMB3441, and KMB3481 from Invitrogen and RUO80177 from Innogenetics). The levels of sAPPβSWE and sAPPα in the soluble (DEA) fractions were measured using the MSD technology platform (K111BUE-2 and K111BSE-2; Meso Scale Discovery). All assays were validated in-house and cross-reactivity between human and mouse Aβ-sequences were found to be negligible. To compensate for matrix effects, plasma or brain homogenates from nontransgenic mice were used for preparation of standard curves. The lower limit of quantification (LLOQ) was determined for each immunoassay plate based on the lowest standard point with a coefficient of variation <20% and an accuracy (back-calculated concentrations) of 80–120%. Analysis of data was done with pairwise comparisons as t tests within a one-way ANOVA model on log transformed data, using Prism 4 (GraphPad). Level of significance was set at p < 0.05 (two-tailed). Bioanalysis of in vivo samples. The right brain hemisphere was homogenized in two volumes (w/v) of Ringer's solution. Aliquots of plasma (25 μl) and brain homogenate (50 μl) were precipitated with 150 μl acetonitrile containing 200 nmol/L warfarin as a generic internal standard. Samples were mixed, centrifuged, diluted with mobile phase, and analyzed on an liquid chromatography/mass spectrometry (LC-MS/MS) system. CSF aliquots (15 μl) were directly diluted and injected. Correction for blood content in brain was made by subtracting 1.3% of the plasma concentration from the total brain concentration. Binding to plasma proteins and brain tissue. AZ-4217 was added to female C57BL/6 mouse or male Dunkin–Hartley guinea pig plasma to a final concentration of 10 μmol/L. An aliquot was dialyzed against phosphate buffer and incubated for 18 h at 37°C. Proteins were removed from 50 μl aliquots of dialyzed plasma and buffer samples, internal standard was added, and the samples were analyzed with LC-MS/MS. The unbound fraction in plasma was calculated from the ratio of the MS area of AZ-4217 in buffer divided by sum of the areas of AZ-4217 in buffer and plasma. Recovery and stability in plasma were controlled for. Protein plasma binding for female Tg2576 mice was assumed to be comparable to that of C57BL/6 mice. To determine brain tissue binding, 300-μm-thick coronal rat brain slices were incubated for 5 h in 10 ml of an artificial interstitial fluid buffer containing 1 μm AZ-4217. Following the incubation, slices were weighted and homogenized, proteins were removed, and LC-MS/MS analysis was performed. The unbound fraction in brain was calculated as described by Fridén et al., 2009. Mouse and guinea pig total brain concentrations were converted to free concentrations by multiplying with the unbound fraction. It has been shown that this unbound fraction in brain is interexchangeable between different species (Di et al., 2011). Pharmacokinetic/pharmacodynamic (PK/PD) modeling was performed using WinNonlin (Version 5.2; Pharsight Corporation). A simultaneous fit for all doses of the PK profile in plasma or brain was performed per species/strain using a one-compartment PK model. Total brain concentrations were converted to free brain levels using brain exposure, plasma protein, and brain binding. Aβ levels in treated animals were converted to values relative to vehicle by calculation of the mean Aβ level measured in vehicle-treated animals per experiment per time point followed by calculation of the Aβ levels in treated animals as percentage of vehicle mean. The fitted brain concentrations were used to drive an indirect response model with an assumed inhibition on the production rate (kin; Dayneka et al., 1993) to estimate the turnover rate of Aβ in brain (kout) and the concentration giving 20% inhibition from baseline of Aβ in brain (IC20, including the time delay due to the Aβ turnover rate). The outcome of this fit was used to calculate the IC50 to allow direct comparison with in vitro models. The potency of AZ-4217 to inhibit human BACE1 and its closely related enzymes was evaluated in vitro (Table 1). AZ-4217 inhibited recombinant human BACE1 in a concentration-dependent manner, reaching 100% inhibition, with a Ki of 1.8 nm. AZ-4217 inhibited the other isoform of BACE, human BACE2, with a Ki of 2.6 nm. AZ-4217 showed more than a 10,000-fold selectivity against another aspartic protease, Cathepsin D (Ki > 25 μm). In SH-SY5Y cells stably overexpressing wild-type APP695, AZ-4217 decreased the secretion of Aβ40 in a concentration-dependent manner with an IC50 of 200 pm. In wild-type SH-SY5Y cells AZ-4217 decreased the secretion of sAPPβ with an IC50 of 160 pm. The potency difference between the enzymatic assay and the cell assays was expected as the substrate peptide in the TR-FRET assay carries the Swedish mutation (APPSWE) and the cells express wild-type APP. 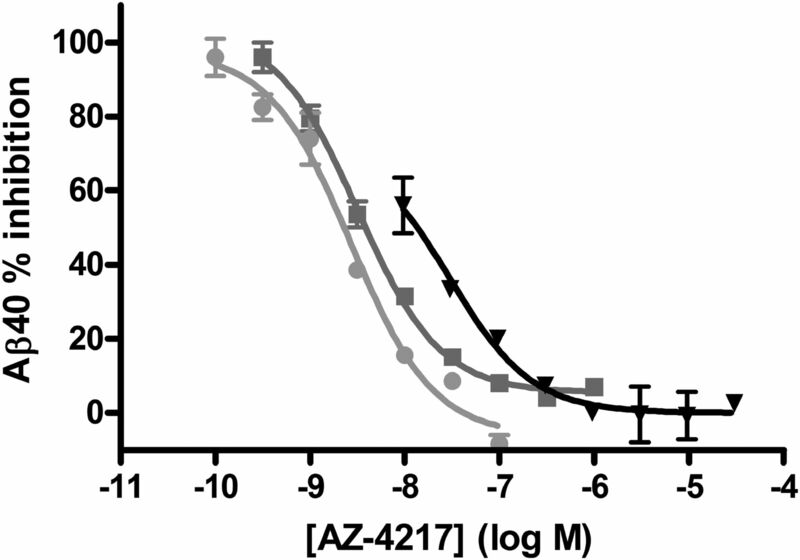 In a similar fashion AZ-4217 decreased the Aβ40 levels secreted from primary cortical neurons from C57BL/6 mice, Tg2576 mice, and guinea pigs, resulting in IC50 values of 2.7, 38, and 2.0 nm, respectively (Fig. 2). Hence, AZ-4217 was 14 times less potent in the Tg2576 primary cortical neurons compared with the C57BL/6 mouse cell assay, based on Aβ40 readout. Concentration-dependent reduction of Aβ40 generation in cortical primary neurons from guinea pig and C57BL/6 and Tg2576 mice. Concentration-dependent reduction of Aβ40 generation in cortical primary neurons from guinea pig (filled circles), C57BL/6 (squares), and Tg2576 (triangles) mice, after AZ-4217 treatment. AZ-4217 completely inhibited the Aβ40 production in the three cell systems, with the highest potency observed in the guinea pig cells. Data shown as mean ± SEM. AZ-4217 was tested in a panel of 98 in vitro radioligand binding and enzyme assays, covering a diverse range of receptors, ion channels, transporters, and enzymes, up to a concentration of 10 μm. A few significant hits were observed; however, these had at least a 2400-fold selectivity against BACE1, thus indicating specific binding to BACE (data not shown). The in vitro plasma protein binding of AZ-4217 was determined by equilibrium dialysis for both mouse and guinea pig. The unbound fractions were 1.5 ± 0.3% and 0.87 ± 0.15% for mouse and guinea pig, respectively (mean ± SD). AZ-4217 was found to be stable in plasma for at least 24 h. The free fraction in brain tissue was 1%. To study the concentration effect relationship of AZ-4217 in vivo, the compound was orally dosed to C57BL/6 mice (25 μmol/kg, 50 μmol/kg, 100 μmol/kg, or 200 μmol/kg) followed by a PK/PD analysis. The simultaneous fit of the resulting PK profiles in plasma estimated an almost proportional increase in exposure with increased dose. Clearance was estimated to 0.73 ± 0.05 L/h/kg (estimate ± SE on the estimate), volume to 5.7 ± 0.3 L/kg, and the absorption rate constant to 3.7 ± 1.0 h−1. The maximum concentration (Cmax) in plasma was estimated to 1.0 h after dose (Fig. 3A). The PD effect readout was brain-soluble Aβ40/42 and sAPPβ levels. Maximum reduction of brain Aβ40 and Aβ42 (Fig. 3B,D) occurred at a later time point than Cmax in plasma and brain resulting in a hysteresis-loop in the concentration-effect relationship (Fig. 3C). Despite a tendency of the compound not to reach immediate brain plasma ratio equilibrium, the concentration in plasma had an almost linear relationship to the concentration in brain (Fig. 3E). The maximum effect on brain sAPPβ (29% reduction from vehicle) was observed 6 h after an acute 100 μmol/kg dose of AZ-4217 (Fig. 3F). The PK parameter estimates of the compound in brain were used to simultaneously fit brain Aβ40 or Aβ42 levels relative to vehicle in time– and dose–response profiles to estimate the in vivo potency and the turnover half-life of Aβ. This half-life was estimated to 47 min for Aβ40 (Table 2) and 35 min for Aβ42, respectively. The IC50 free in brain was estimated to 4.7 nm for Aβ40 (Table 2) and 5.0 nm for Aβ42. Time- and dose/concentration-dependent inhibition of Aβ generation in plasma and brain of C57BL/6 mice. 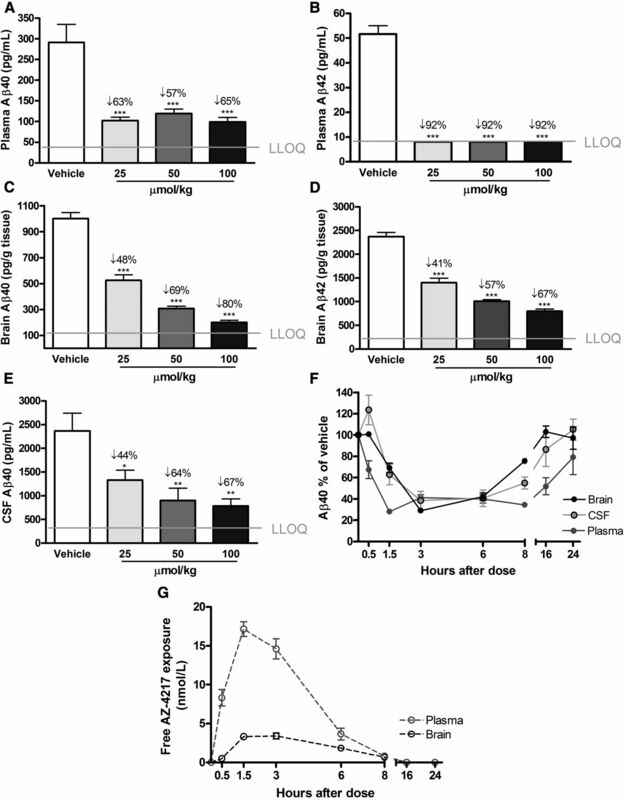 Time- and dose-dependent inhibition of Aβ generation in C57BL/6 mice after a 25 μmol/kg (diamonds), 50 μmol/kg (squares), 100 μmol/kg (triangles), or 200 μmol/kg (filled circles) oral dose. Mean ± SD observed and fitted time-plasma exposure profiles (A). Mean ± SD observed and fitted time-Aβ40 in brain profiles (B). Plasma exposure versus observed mean ± SD and fitted Aβ40 in brain (C). Mean ± SD observed and fitted time-Aβ42 in brain profiles (D). Unbound plasma versus free brain concentrations as measured in individual mice at the different doses and time points (E). Only values above LLOQ are shown, the mean levels (±SEM, n = 59) of Aβ40 and Aβ42 in the vehicle-treated groups were 4352 ± 136 and 1072 ± 31 pg/g tissue, respectively. The effect on sAPPβ was also studied and displayed maximum reduction at 6 h after a 100 μmol/kg dose (F). Data are presented as mean values ± SEM (**p < 0.01, compared with vehicle). The dose–response effect of AZ-4217 on plasma, brain, and CSF Aβ in guinea pigs was investigated 3 h after an oral dose of 25 μmol/kg, 50 μmol/kg, or 100 μmol/kg and time-dependent effects were studied between 0.5 and 24 h after a 50 μmol/kg dose (Fig. 4). In the dose–response study, a clear effect on soluble Aβ levels in plasma, brain, and CSF was observed. Plasma Aβ40 seemed to have reached a 55–65% reduction regardless of dose at the 3 h time point, Aβ42 levels were reduced down to the lower limit of quantification of the ELISA assay even at the lowest dose, resulting in a >90% reduction (Figs. 4A,B). AZ-4217 displayed a dose-dependent reduction of brain-soluble Aβ with a maximum estimated effect of 80 and 67%, respectively, for Aβ40 and Aβ42 (Fig. 4C,D). As in brain, AZ-4217 inhibition of CSF Aβ40 generation was dose dependent (Fig. 4E) with a maximum calculated effect of 67% at the highest dose. The time-dependent reduction of plasma, brain, and CSF Aβ40 as well as AZ-4217 exposure in plasma and brain were evaluated in the time–response study (Fig. 4F,G). Plasma Aβ40 reached maximum reduction 1.5 h after dose (∼70%) and this reduction was sustained up until 8 h after dosing. After 16 h Aβ levels in plasma were still reduced to ∼50% of the vehicle-treated group, and even after 24 h had the Aβ40 levels in plasma not returned back to baseline. Sixteen hours after the 50 μmol/kg dose one of six guinea pigs had a plasma exposure below the LLOQ of 5 nm, while the remaining 5 had a mean exposure of 9.4 ± 5.5 nm (mean ± SD). Twenty-four hours after the oral dose of 50 μmol/kg none of the six guinea pigs had a plasma exposure above LLOQ. In brain, the time-dependent reduction of Aβ40 displayed maximum effect 3 h after dose (∼70%), at 8 h after dose the effect was still significant (∼20%), but at 16 h levels were back to baseline. The time course of CSF Aβ40 followed that of brain Aβ40 as depicted in Figure 4F. Time- and dose-dependent inhibition of Aβ generation in guinea pig AZ-4217 was given to guinea pigs via oral gavage at doses 25 μmol/kg, 50 μmol/kg, or 100 μmol/kg and effects were observed after 3 h (A–E). Inhibition of plasma Aβ40 (A) and Aβ42 (B) seemed to reach a plateau, with Aβ42 reduced down to the LLOQ of the assay. Brain Aβ40 (C) and Aβ42 (D) were reduced dose dependently. CSF Aβ40 (E) also displayed a dose-dependent reduction. The time–response effects on brain, CSF, and plasma Aβ40 (Aβ42 not shown) of AZ-4217 were studied with 50 μmol/kg (F), as well as the free concentration of AZ-4217 in plasma and brain (G). Data are presented as mean values ± SEM (*p < 0.05; **p < 0.01, ***p < 0.001, compared with vehicle). A simultaneous fit of the plasma exposure after an oral 25 μmol/kg, 50 μmol/kg, or 100 μmol/kg dose revealed a linear increase in exposure with dose between doses 50 and 100 μmol/kg. In contrast, the 25 μmol/kg dose had only a factor 0.4 of the expected plasma exposure. Using brain exposure PK profiles the turnover half-life of Aβ40 was estimated to 53 min (Table 2) and of Aβ42 to 65 min with an IC50 free in brain of 1.8 nm, for both. The effect of AZ-4217 on Aβ deposition in brain was studied in 12-month-old Tg2576 mice. Both the effects on transgenic human Aβ (hAβ) and endogenous mouse Aβ (mAβ) in the soluble (DEA extracted) and insoluble (FA extracted) pools were studied. Insoluble Aβ is believed to come from Aβ deposits but appears before Aβ plaques can be visualized by immunohistochemistry in brain from Tg2576 mice (Kawarabayashi et al., 2001). Funato et al. (1998) have further shown that insoluble Aβ42 correlates very well with the amyloid burden in human brains and that the accumulation of insoluble Aβ42 precedes that of visual plaques. Thus, biochemical evaluation of insoluble Aβ is a more sensitive way of quantitatively evaluating effects on Aβ deposition in animal with no or few plaques. Nontransgenic animal do not develop plaques and consequently no insoluble Aβ can be detected. We have, however, studied the accumulation of endogenous mAβ with age in Tg2576 mice, which increases both in the soluble and the insoluble brain pools (K. Dillner-Bergstedt, A. Bogstedt, D. Sunnemark, P. Appelkvist, F.-H. Wang, M. Lindberg, S. Schött, B. Georgievska, H. Wigström, S. Eketjäll, and J. Sandin, manuscript in preparation); co-aggregation of mAβ with hAβ has also been shown in transgenic mice overexpressing APP with the London mutation (Pype et al., 2003). Given the higher in vitro IC50 for APPSWE, female Tg2576 mice (12 months at termination) were treated with 200 μmol/kg AZ-4217, acutely, 7 d or 28 d and terminated 4.5 h after last dose. In brain, reductions in soluble and insoluble hAβ40 and Aβ42 (∼20–30%, p < 0.05) were only seen after 28 d of treatment (Fig. 5A–D). Interestingly, acute effects on the direct product of BACE1, sAPPβSWE, were clearly seen already after a single dose of AZ-4217, as well as elevation of sAPPα levels, and the effect levels remained the same independent of duration of treatment, confirming consistent inhibition of BACE1 in the brain throughout the period (Fig. 5E). We also studied the variation of the levels of sAPPα and sAPPβSWE in DEA brain homogenates fromTg2576 mice and found them to be comparatively stable between the age of 3 and 24 months (Fig. 5F) Plasma hAβ40 was reduced down to the lower limit of quantification of the ELISA assay in all AZ-4217 Tg2576 treatment groups (data not shown). Moreover no acute effects were observed on endogenous mAβ in the 12-month-old Tg2576 mice. However, soluble brain mAβ40 and mAβ42 were, after 7 d of treatment, reduced ∼40% and ∼25%, respectively (Fig. 6A,B), while insoluble mAβ40 and mAβ42 levels were only significantly different from vehicle after 28 d of treatment (∼30%) (Fig. 6C,D). After 28 d of treatment, AZ-4217 exposure in plasma and brain was in line with the prediction made on the basis of the acute study performed in C57BL/6 mice as reported above. Acute and long-term treatment of Tg2576 mice with AZ-4217. Female Tg2576 (12 months at termination) mice were treated with 200 μmol/kg AZ-4217 acutely or repeatedly once daily for 7 and 28 d, terminated 4.5 h after last dose. Significant effects on brain hAβ40 and hAβ42 were only seen after 28 d of treatment in both the soluble (A, B) and the insoluble (C, D) brain pools. Target engagement was seen already after acute treatment both on brain sAPPβSWE, reduced, and brain sAPPα, elevated (E). The levels of sAPPβSWE (triangles) and sAPPα (squares) in DEA brain homogenates were stable in female Tg2576 mice between 3 and 24 months of age (F). Data are presented as mean values ± SEM (*p < 0.05; **p < 0.01, ***p < 0.001, compared with vehicle). The mean levels (pg/mg tissue ± SEM, n = 72/77) in the vehicle-treated groups were 396 ± 26 (soluble hAβ40), 207 ± 9 (soluble hAβ42), 2399 ± 193 (insoluble hAβ40), and 2961 ± 148 (insoluble hAβ42). Effects on endogenous mAβ in 12-month-old Tg2576 mice treated with AZ-4217. In the same Tg2576 brain extracts, as hAβ were measured, we also evaluated the effects on endogenous mAβ. Significant reductions of soluble endogenous brain mAβ40 and mAβ42 were observed after 7 d of treatment (A, B). As with hAβ-insoluble endogenous brain mAβ40, hAβ42 only displayed significant effects after 28 d of treatment (C, D). Data are presented as mean values ± SEM (*p < 0.05; **p < 0.01, ***p < 0.001, compared with vehicle). The mean levels (pg/mg tissue ± SEM, n = 77) in the vehicle-treated groups were 8 ± 0.5 (soluble mAβ40), 8 ± 0.4 (soluble mAβ42), 53 ± 3 (insoluble mAβ40), and 88 ± 5 (insoluble mAβ42). There is a great need for therapeutic interventions to stop/slow the progress of AD. As a key target implicated in pathophysiology, drugs targeting amyloid production and/or clearance are currently pursued. The γ-secretase inhibitors and Aβ antibodies tested to date have failed to reach primary clinical endpoints, and so much emphasis has been put into developing BACE1 inhibitors or modulators of the γ-secretase complex as targets early in the production of Aβ (D'Onofrio et al., 2012; Probst et al., 2012; Xia et al., 2012). A general concern with targeting BACE1 or γ-secretase is that it may result in adverse target-related effects due to the involvement of these secretases in other signaling pathways (Vassar et al., 2009). The identity and full physiological importance of other BACE1 substrates in addition to APP are, with few exceptions, largely unknown. However, a number of recent reports suggests that some of the functional aspects of BACE1 (conveyed by its substrates such as neuregulin, β-subunit of Na+ channels, etc.) may be important, at least during development (Hu et al., 2006; Kim et al., 2011; Cai et al., 2012; Cao et al., 2012). Of note, most of the new information regarding the significance of BACE1 and its substrates for normal physiological function is derived from transgenic mouse work. However, the findings described in BACE1 knock-out mice could be characterized as a developmental phenotype that only manifested itself in homozygous knock-out animals, and thus pharmacologic inhibition of BACE1 in adult humans may have different manifestations. 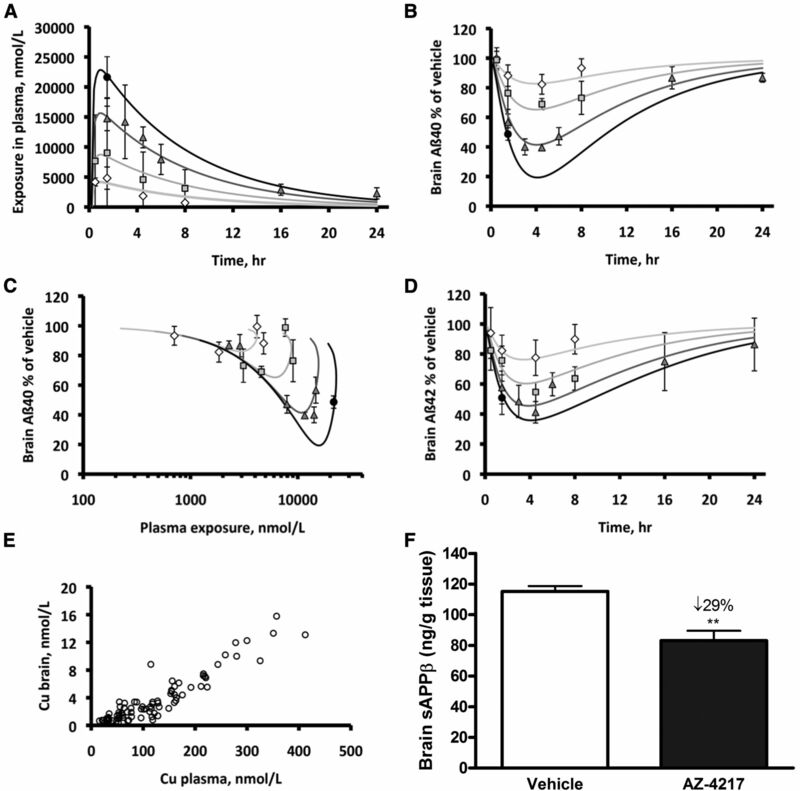 AZ-4217 displays similar inhibition of BACE1 and BACE2. In contrast to BACE1, BACE2 is expressed at very low levels in neurons and the role of BACE2 in APP processing and disease, or if inhibition of BACE2 would increase safety concerns, remains uncertain. An additional way forward to achieving an improved therapeutic efficacy safety window is to aim for compounds with very high affinity, thereby facilitating a low human dose and limiting off-target-related safety concerns. There is, however, a risk that a high-affinity active site inhibitor could increase the potency against other potential substrates and, consequently, induce toxicity. Nevertheless, provided the high-affinity compound possesses good PK properties, the overall safety risk including idiosyncratic toxicity and off-target toxicity should be reduced considering that the exposure required to achieve a therapeutic effect will be substantially lower compared with medium or poor affinity compounds. The crystal structure of AZ-4217 in complex with BACE1 was reported previously (Swahn et al., 2012). The binding of AZ-4217 to BACE1 translates into a potent compound in human SH-SY5Y cells (160 pm) with an excellent in vivo efficacy profile in three different preclinical animal models. 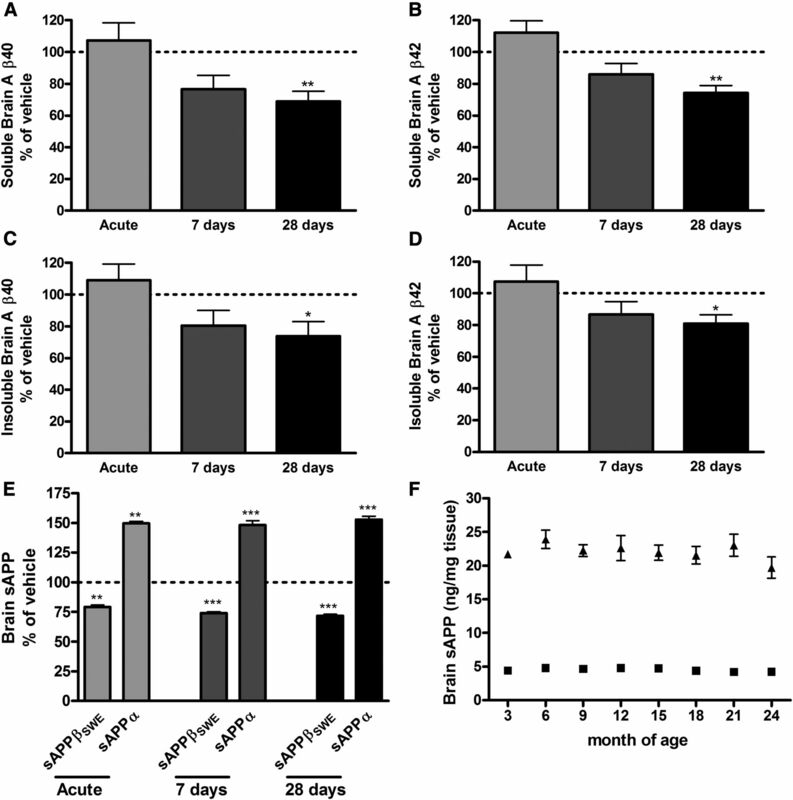 Wild-type C57BL/6 mice and guinea pigs, expressing endogenous APP and BACE1, were used for demonstration of efficacy of AZ-4217 on Aβ levels in plasma, brain, and CSF in a native setting. The in vitro potency as observed in the primary neurons translated well to the in vivo potency in mouse. Wild-type mice do not develop plaque. Therefore, in mice plaque burden is preferably studied in transgenic overexpressing models, which do develop amyloid plaques. One such model is the Tg2576 mouse model overexpressing human APP with the Swedish mutation (APPSWE), which develops amyloid plaques at 8–12 months of age (Hsiao et al., 1996; Kawarabayashi et al., 2001). To build confidence for efficacy in a disease setting, i.e., in addition to reducing soluble toxic species of Aβ to also reducing Aβ deposition in brain, Tg2576 mice were used to study the efficacy of AZ-4217. BACE1 has a higher affinity for the APPSWE, which leads to increased APP processing and elevated levels of Aβ peptides (Vassar et al., 1999). Thus, this mutation renders BACE1 inhibitors less potent in such systems, as is reflected in the 14-fold potency drop in cellular IC50 of Tg2576 relative to that of C57BL/6 mice primary neurons. Aware of these constrains of the Tg2576 mouse model in evaluating a BACE1 inhibitor potency, both human Aβ (formed from overexpressed APPSWE) and endogenous mouse Aβ were measured. Significant effect on plasma Aβ was shown already after a single dose of AZ-4217. Effect in brain was also observed after a single dose in form of brain sAPPβSWE decrease, making the APP substrate available for α-secretases leading to increased sAPPα levels. To our knowledge this is the first time BACE1 inhibition is demonstrated in the brain parenchyma after a single oral administration of a BACE1 inhibitor to Tg2576 mice. Noteworthy is also that the magnitude of the effect on both sAPPβSWE and sAPPα does not change with treatment length. Intriguingly, brain Aβ40/42 reductions in this Tg2576 mouse model, independent of being endogenous or derived from the overexpressed human APPSWE, only showed a reduction on soluble Aβ40/42 after repeated dosing for 7 d and on insoluble Aβ40/42 when treated for 28 d. These finding are in line with the observations made by Fukumoto et al. (2010) where they demonstrated effects on Tris-soluble Aβ in the brain of young Tg2576 mice after 7 weeks of oral administration of a BACE1 inhibitor and on insoluble (FA) Aβ in 13-month-old Tg2576 mice after 6 months of treatment. Chang et al. (2011) demonstrated effects on interstitial fluid Aβ40 in young Tg2576 mice after an acute dose of a BACE1 inhibitor but only observed effects on brain extracts after long-term treatment. The difficulties of demonstrating acute effects on soluble brain Aβ in Tg2576 mice after a single administration of a BACE1 inhibitor has also been reported by others (Malamas et al., 2010). In contrast to what others have reported (Fukumoto et al., 2010) we do not see any changes in the levels of sAPPβSWE or sAPPα, the direct products of BACE1 and α-secretase activities, in female Tg2576 mice 3–24 months of age. Indicating that the activities of these enzymes are stable with age in Tg2576 mice. Accumulation of Aβ in brain with age in Tg2576 mice and in AD patients is more likely to be the results of decreased transport and/or clearance of Aβ (Hartz et al., 2010; Mawuenyega et al., 2010). As observed in our studies BACE1 inhibition could therefore only manifest itself acutely in brain on sAPPβSWE and not on soluble and insoluble Aβ in 12-month-old Tg2576 mice, where transport and/or clearance of Aβ is reduced and the majority of extracted Aβ comes from deposits, i.e., is not newly synthesized (Hong et al., 2011). Nevertheless, our data point to the concept that a BACE1 inhibitor can affect Aβ deposition in brain after long-term treatment. Although beyond the scope of the present study, it is worthwhile to note that treatment with AZ-4217 was very well tolerated throughout the study and did not produce any noticeable adverse effects, presumably because of the high target selectivity of the AZ-4217 and the low systemic burden that was enabled by the high affinity of the compound toward BACE1. In summary, we present the discovery and pharmacological profile of AZ-4217, a novel BACE1 inhibitor with high potency in in vitro and in vivo systems. Furthermore, we demonstrate that in a 1 month treatment paradigm BACE1 inhibition of Aβ production does lower amyloid deposition in brain of 12-month-old Tg2576 mice. 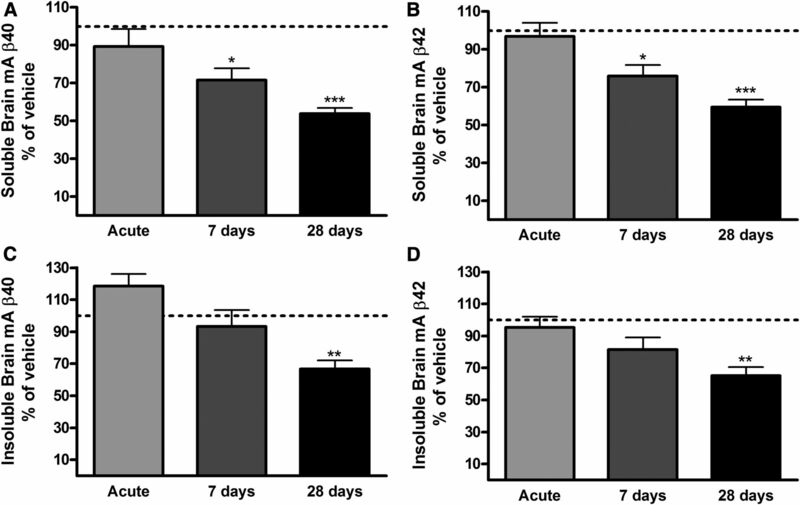 In these mice BACE1 inhibition was confirmed already after a single dose, while effects on soluble and insoluble brain Aβ were only observed after repeated dosing. Choosing the right in vivo model and the right biomarker for preclinical screening is therefore of upmost importance. Our results strongly support BACE1 inhibition as effective for reduction of soluble toxic Aβ species and for lowering plaque deposition over time, hence potentially as a useful therapeutic intervention in an appropriate AD population. This work was founded by AstraZeneca and all authors were at the time of the work employees of AstraZeneca. A special thanks to Daniel Bergström, Ann Staflund, and Anette Stålebring-Löwstedt for excellent animal husbandry and technical assistant. Kerstin Nilsson is acknowledged for statistical support and Anna Bogstedt for Aβ measurements. Special thanks also to Eva Spennare for determining the fraction unbound in brain by the brain slice method and Jenny Johansson for measuring the plasma protein binding. Per-Olof Markgren and Karin Kaspersson are acknowledged for additional affinity measurements and for critical reading of this manuscript. (2011) Alzheimer's disease. Lancet 377:1019–1031, doi:10.1016/S0140-6736(10)61349-9, pmid:21371747. (2012) β-Secretase (BACE1) inhibition causes retinal pathology by vascular dysregulation and accumulation of age pigment. EMBO Mol Med 4:980–991, doi:10.1002/emmm.201101084, pmid:22903875. (2012) The precision of axon targeting of mouse olfactory sensory neurons requires the BACE1 protease. Sci Rep 2:231, pmid:22355745. (2011) β-Secretase inhibitor GRL-8234 rescues age-related cognitive decline in APP transgenic mice. FASEB J 25:775–784, doi:10.1096/fj.10-167213, pmid:21059748. (1992) Mutation of the beta-amyloid precursor protein in familial Alzheimer's disease increases beta-protein production. Nature 360:672–674, doi:10.1038/360672a0, pmid:1465129. (1993) Comparison of four basic models of indirect pharmacodynamic responses. J Pharmacokinet Biopharm 21:457–478, doi:10.1007/BF01061691, pmid:8133465. (2011) Species independence in brain tissue binding using brain homogenates. Drug Metab Dispos 39:1270–1277, doi:10.1124/dmd.111.038778, pmid:21474681. (2012) Advances in the identification of γ-secretase inhibitors for the treatment of Alzheimer's disease. Expert Opin Drug Discov 7:19–37, doi:10.1517/17460441.2012.645534, pmid:22468891. (2012) The novel BACE inhibitor MK-8931 dramatically lowers cerebrospinal fluid Ab peptides in healthy subjects following single-and multiple-dose administration. ICAD conference abstract. Alzheimers Dement 8:704, doi:10.1016/j.jalz.2012.05.1900. (2009) Development of a high-throughput brain slice method for studying drug distribution in the central nervous system. Drug Metab Dispos 37:1226–1233, doi:10.1124/dmd.108.026377, pmid:19299522. (2010) A noncompetitive BACE1 inhibitor TAK-070 ameliorates Aβ pathology and behavioral deficits in a mouse model of Alzheimer's Disease. J Neurosci 30:11157–11166, doi:10.1523/JNEUROSCI.2884-10.2010, pmid:20720123. (1998) Quantitation of amyloid beta-protein (A beta) in the cortex during aging and in Alzheimer's disease. Am J Pathol 152:1633–1640, pmid:9626067. (2002) The amyloid hypothesis of Alzheimer's disease: progress and problems on the road to therapeutics. Science 297:353–356, doi:10.1126/science.1072994, pmid:12130773. (2010) Restoring blood-brain barrier P-glycoprotein reduces brain amyloid-beta in a mouse model of Alzheimer's disease. Mol Pharmacol 77:715–723, doi:10.1124/mol.109.061754, pmid:20101004. (2011) Dynamic analysis of amyloid β-protein in behaving mice reveals opposing changes in ISF versus parenchymal Aβ during age-related plaque formation. J Neurosci 31:15861–15869, doi:10.1523/JNEUROSCI.3272-11.2011, pmid:22049429. (1996) Correlative memory deficits, Abeta elevation, and amyloid plaques in transgenic mice. Science 274:99–102, doi:10.1126/science.274.5284.99, pmid:8810256. (2012) Structure- and property-based design of aminooxazoline xanthenes as selective, orally efficacious, and CNS penetrable BACE inhibitors for the treatment of Alzheimer's disease. J Med Chem 55:9156–9169, doi:10.1021/jm300598e, pmid:22928914. (2006) Bace1 modulates myelination in the central and peripheral nervous system. Nat Neurosci 9:1520–1525, doi:10.1038/nn1797, pmid:17099708. (2012) J Biol Chem 287:41245–41257. (2012) A mutation in APP protects against Alzheimer's disease and age-related cognitive decline. Nature 488:96–99, doi:10.1038/nature11283, pmid:22801501. (2001) Age-dependent changes in brain, CSF, and plasma amyloid (beta) protein in the Tg2576 transgenic mouse model of Alzheimer's disease. J Neurosci 21:372–381, pmid:11160418. (2011) Reduced sodium channel Na(v)1.1 levels in BACE1-null mice. J Biol Chem 286:8106–8116, doi:10.1074/jbc.M110.134692, pmid:21190943. (2012) First-in human study of E2609, a novel BACE1 inhibitor, demonstrates prolonged reductions in plasma β-amyloid levels after single dosing. Alzheimer Dement 8:96, doi:10.1016/j.clinthera.2011.01.016. (2010) Design and synthesis of aminohydantoins as potent and selective human β-secretase (BACE1) inhibitors with enhanced brain permeability. Bioorg Med Chem Lett 20:6597–6605, doi:10.1016/j.bmcl.2010.09.029, pmid:20880704. (2010) Decreased clearance of CNS beta-amyloid in Alzheimer's disease. Science 330:1774, doi:10.1126/science.1197623, pmid:21148344. (2011) Robust Central. Reduction of amyloid-b in humans with an orally available, non-peptidic β-secretase inhibitor. J Neurosci 31:16507–16516, doi:10.1523/JNEUROSCI.3647-11.2011, pmid:22090477. (2007) Partial reduction of BACE1 has dramatic effects on Alzheimer plaque and synaptic pathology in APP transgenic mice. J Biol Chem 282:26326–26334, doi:10.1074/jbc.M611687200, pmid:17616527. (2012) Small-molecule BACE1 inhibitors: a patent literature review (2006–2011) Expert Opin Ther Pat 22:511–540, doi:10.1517/13543776.2012.681302, pmid:22512789. (2003) Characterization of amyloid beta peptides from brain extracts of transgenic mice overexpressing the London mutant of human amyloid precursor protein. J Neurochem 84:602–609, doi:10.1046/j.1471-4159.2003.01556.x, pmid:12558980. (2001) BACE knock-out mice are healthy despite lacking the primary beta-secretase activity in brain: implications for Alzheimer's disease therapeutics. Hum Mol Genet 10:1317–1324, doi:10.1093/hmg/10.12.1317, pmid:11406613. (2009) First demonstration of cerebrospinal fluid and plasma Aβ lowering with oral administration of a β-site amyloid precursor protein-cleaving enzyme 1 Inhibitor in nonhuman primates. J Pharmacol Exp Ther 328:131–140, doi:10.1124/jpet.108.143628, pmid:18854490. (2006) Macrocyclic inhibitors of β-secretase: functional activity in an animal model. J Med Chem 49:6147–6150, doi:10.1021/jm060884i, pmid:17034118. (2012) Design and synthesis of β-site amyloid precursor protein cleaving enzyme (BACE1) inhibitors with in vivo brain reduction of β-amyloid peptides. J Med Chem 55:9346–9361, doi:10.1021/jm3009025, pmid:22924815. (1999) Beta-secretase cleavage of Alzheimer's amyloid precursor protein by the transmembrane aspartic protease BACE. Science 286:735–741, doi:10.1126/science.286.5440.735, pmid:10531052. (2009) The beta-secretase enzyme BACE in health and Alzheimer's disease: regulation, cell biology, function, and therapeutic potential. J Neurosci 29:12787–12794, doi:10.1523/JNEUROSCI.3657-09.2009, pmid:19828790. (2006) Control of peripheral nerve myelination by the β-secretase BACE1. Science 314:664–666, doi:10.1126/science.1132341, pmid:16990514. (2012) γ-Secretase modulator in Alzheimer's disease: shifting the end. J Alzheimers Dis 31:685–696, pmid:22710916.